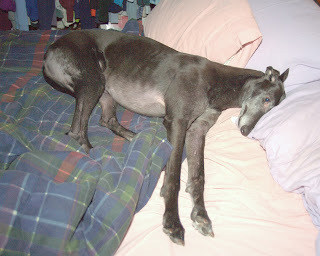 When you get a greyhound (or any dog for that matter), you may think that they will be easier than kids. OK, with a dog, maybe you still can’t go out or travel on a whim like you used to. And maybe also you’ll have to be home to feed the hounds or they become quite grumpy and raise a fuss. And for sure they will sometimes embarrass you in public (the hounds that is, but is this sounding familiar, parents of human children?). Yet, at least you’ll be able to sleep in the morning. Unlike human children who will wake at the crack of dawn and come running into your room to wake you in some rude way, your dogs will sleep politely until the master gets up. NOT. Greyhounds (and dogs in general) have unerring internal clocks. Make no mistake, readers. They know exactly when it’s time to go out. They know exactly when it’s time for dinner. They know exactly what day of the week it is and if it’s the day that you’re supposed to take them to the doggy store. Formal and informal studies have been conducted and dogs always seem to know when it’s time for mum or dad to be home from work. In my case, when I adopted my first greyhound, Girly Girl, I was hoping to find a new best friend. A companion. I was not expecting to get a four legged, fur covered, pooping and peeing alarm clock. 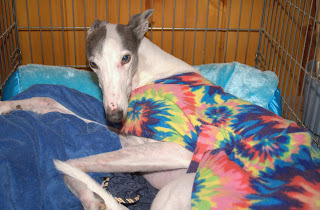 Since that first naïve moment, all of my greyhounds have functioned as alarm clocks. I admit this has, on a couple of occasions, been to my benefit. When my alarm clock fails to go off and I’m in danger of oversleeping and getting to work late, I can count on the furry kids to make sure I’m up and ready on time. There is one small problem with this unexpected canine benefit. You cannot set a greyhound. No matter how hard you try. I suspect it is the same with all dogs, based on my informal market research. I have fashioned a sort of snooze button on the alarm clock that is Bettina. If she has not slept with me the night before, I can insist she join me on the bed. Once she joins me, she’ll forget her original mission for awhile and settle in for a short nap with mumma. Unfortunately for mumma, Bettina is fairly smart. She is learning this trick and she has been developing some counter measures. She’ll be sure to cuddle up right near my head and lay her head on my shoulder. I may try to go back to sleep but it’s not long before I get the feeling someone is watching me. Opening one eye, sure enough, I see Bettina’s face, about an inch from mine, staring at me intently. Get up mumma? Sometimes, if I’m determined to sleep in a bit, I may be able to ignore the stare. Bettina has developed a secondary offense for this situation. With her head still on my shoulder, a mere inch from my face, she sneezes. You would expect that the noise directly in your ear would make sleep difficult, but what is more bracing is the unknown liquid-ish substance that she spews on the closest side of my face. For my own sanity, I don’t think too much about what it is she’s just sneezed all over my eye and cheek. But I can assure you, it does tend to chase all thoughts of sleep from your mind. If Bettina is unsuccessful rousing me out of bed, Blue wages his campaign. He sleeps in the living room, in his crate. Just about the time I’ve gotten Bettina settled and I begin to doze off, I hear Blue’s low pitched whine from the general direction of his crate. He really hams it up and makes it sound like he’s lost his mother and his best friend all in one day. It is quite forlorn and instead of sleeping, you reflexively want to make sure he’s all right. Having learned that he’s playing me, I try to ignore the whines and go back to sleep. After 10 minutes or so without success, Blue heads for the bedroom. He is an old man so when he gets up in his crate, there is much grunting and groaning. He bangs the sides of his crate and rattles whatever he can rattle in the process. I listen as he makes his way from his crate to my bedside. If he can reach my face, he generally sticks his cold nose on my cheek or, even better, in my ear. He renews his whine. If I keep my eyes shut and try to ignore that, he starts prancing back and forth in front of my bed, whining. With Blue I can say, “It’s not time yet buddy.” I may have to say it a couple times but sometimes I can get him to go back to his crate. In 15 minutes, he’s back. On rare occasions I can get him to go back for another 15 minutes. I have learned from experience that I better not try for a third snooze because at that point, he gives up on me and pees in the kitchen. The only thing less pleasant than springing out of bed in the morning because you hear urine hitting the kitchen floor is the sound of a hound vomiting. Usually on one of their beds, or on the carpet. Never ever on a surface that is easy to clean. Sometimes, when Blue comes into the room for the first time, Bettina jumps up from her position on my shoulder. She assaults the other ear while Blue works the one closest to him. Or she joins in his chorus of whines. Or she tramples me in her attempt to get a better look at Blue. Essentially there is no winning when you get the double team. Getting up is the only option. Yes friends, houses with canines never get to sleep in and we’re never late for work. Yay. Several years ago, I decided to bring Girly Girl to be tested for her Canine Good Citizen certification. This is a program administered by the American Kennel Club. There are ten skills that your furry baby must demonstrate mastery of. If successful, the dog receives the title of Canine Good Citizen with which they can…well….I guess not much really. But proud canine parents can brag all over the internet about it. Girly Girl had no formal obedience training. She never attended a class. I had always intended to find us a rally obedience class but didn’t get to it in time. Still, from the outset, Girly Girl was amazingly well behaved. She sat naturally and I was able to teach her down and other basics at home. I felt pretty confident that Girly Girl could earn her Canine Good Citizen certificate even without the formal education. So we found ourselves in a roped off field with our CGC test evaluator. Girly Girl performed all the tasks flawlessly, with the exception of sitting. Though she could and would sit on cue, she decided that on this day, she wasn’t in the mood. I did some fancy talking and managed to convince the evaluator that greyhounds rarely sit. This is actually true for most greyhounds. Of course, after we completed the test and were waiting for our passing paperwork, Girly Girl stepped in front of the evaluator, waited to catch her eye and sat. “Oh yes, I can sit. BUT, only when it suits me.” That was my girl! When I first met Blue at the adoption kennel, HE took me for a walk. Dragged me up and down their long driveway several times. 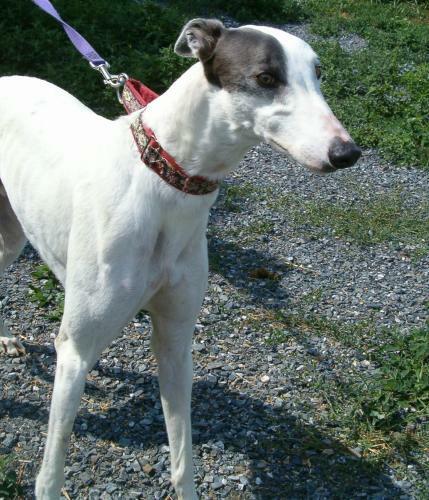 I had asked for a laid back hound figuring that would be the temperament that would fit well with Girly Girl and I. This, however, could not describe the Blue of that time. He was energetic, scattered and apparently deaf to anyone screaming “BLUE! NO! NO! NO!! !.” But oh those beautiful amber eyes accentuated so fabulously by those gray eye patches. 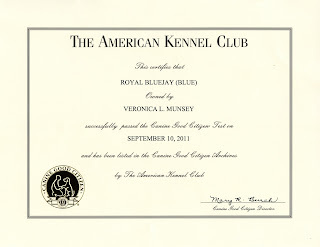 I tried to convince myself that Blue’s behavior was just because of the kennel setting and I signed the check. It wasn’t the kennel setting. For at least the first year Blue remained spastic, over active, willful and quite unwilling to consider learning anything that smacked of obedience. My shoulder was just one of a number of injuries Blue inflicted on me during that time. So on the day of our little celebration for Girly Girl’s success, I just knew that there would never be a day when Blue was calm enough in a crowd or around other dogs or when he would learn even the basics like sit, down or stay. 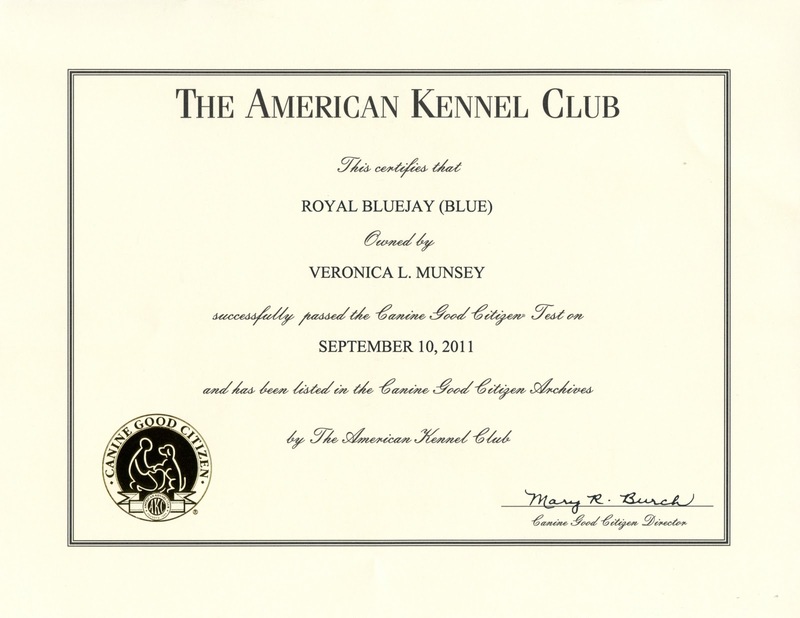 Before anyone calls the ASPCA, I wasn’t trying to scar my baby boy for life when I said to Blue that he’d never earn his CGC. I was simply stating the painfully obvious truth. As in so many things, I was dead wrong. After about 18 months, Blue did calm down. He settled into our routine. He learned to walk politely on leash. Once he figured out he could scam food from every pet store employee he met, he even decided that “down” was worth adding to his repertoire. He drew the line firmly at sit though. Try as I might, I have never been able to get him to perform this maneuver. It was with some sense of irony that this past September Blue and I found ourselves standing in the exact same roped off field, facing the same evaluator for our Canine Good Citizen test. The Blue of 2011 was miles away from the Blue of 2007 and I thought that there just might be a chance he could pass. At worst, we would give it the old college try. Wouldn’t you know it, my wild man turned old man performed all his tasks flawlessly. Possibly even better than Girly Girl had done it. With the exception of sitting. I had to do some more fancy talking to convince our evaluator once again that greyhounds just don’t sit. I had to dance around that one a little longer this time since the dog that tested just before us was also a greyhound and that big show off sat. Our evaluator was kind hearted and she was impressed with Blue’s willingness to down on command and stay put until I released him. So she let the sitting thing slide. We stood waiting for our passing paperwork. Blue waited to catch the evaluator’s attention, he stepped in front of her and…naaah, that would have been too great a story, he didn’t sit. Instead he leaned against her as only greyhounds can, to make sure she was clear on the fact that we don’t need no stinking sit. I must say, the evaluator was quite charmed. That’s my boy!! Back at home we had a small celebration for Bowdoin’s newest Canine Good Citizen. It’s only taken me two greyhounds to learn my lesson. I turned to Bettina and told her that it would likely be many, many years before she ever earned her CGC certification.